Caspian is a full Peruvian black male dripping with luster and exhibiting excellent lock at birth! He has matured into a very calm easy to work with male. Caspian always looks like he is wet. He is very easy to handle. He has great conformation to go along with his excellent lock, luster and consistency. Caspian settled his first females in June of 2007. His first cria was a true black male out of a medium fawn female. His second cria is a true black male out of a light fawn female. His third cria is a bay black male out of a beige female. We are quite pleased with Caspian's first four crias. 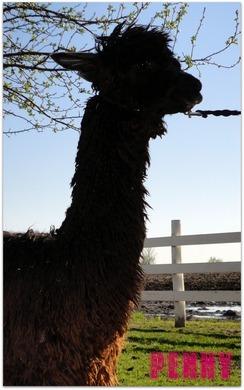 All the 2008 crias have amazing luster and are black. Greta is our top foundation female. She has produced many crias and they have all been beautiful! Greta has never had any issues with breeding or birthing. All of her crias have had exceptional birth weights and high IGG's. 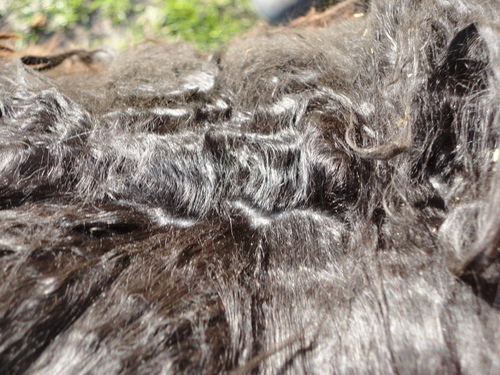 Greta produces a lot of fiber year after year that still have the amazing qualities of her first shearing! Greta will produce crias the same color as the male she was bred to! This is an amazing quality to have in a breeding program! Greta is bred to Sedona Red who is a 9 time blue ribbon winner! 7 of 11 of his cria have been females; they have all been stunning! We are awaiting results of Greta's progesterone test to see if she was succesfully bred to Sedona Red! Penny is a beautiful girl with outstanding bloodlines. Her dam, Greta, is our foundation female and has proven to us her ability to throw color. 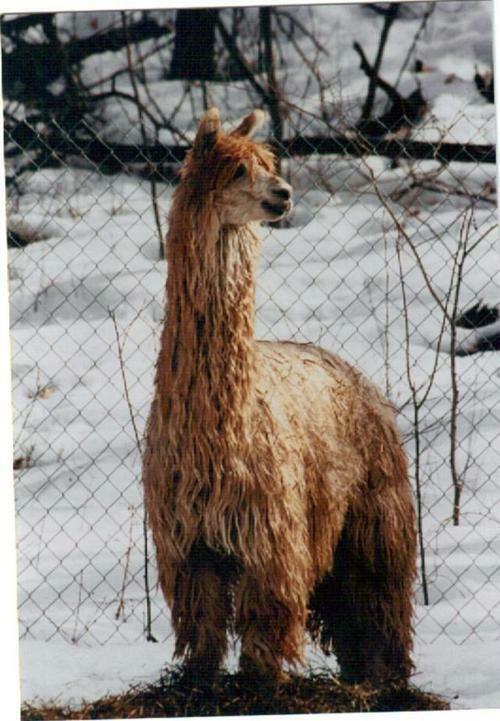 Penny's sire is Caspian of Cairparavel who is full Peruvian, boasting great conformation and consistent lock formation. Caspian has sired many beautiful crias, most of which being dark brown or black. 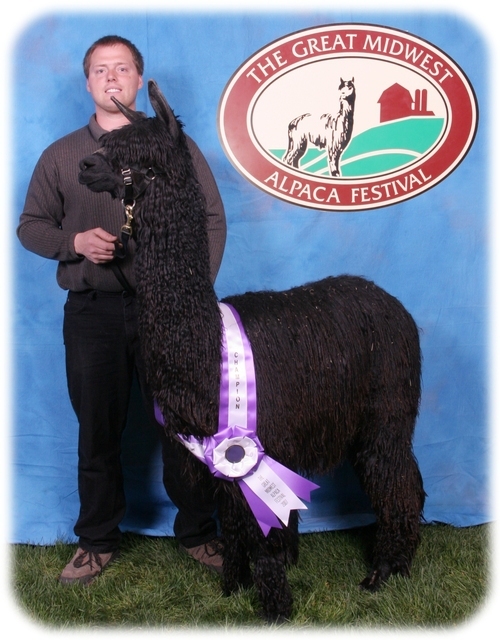 Although Penny Lane did not place well at the Minnesota Alpaca Expo in 2011, judge Kevin O' Leary praised her amazing luster and great density. We are super excited to announce the birth of Penny's first cria! This beautiful boy has outstanding colored bloodlines coming from both Penny and his sire Red October. 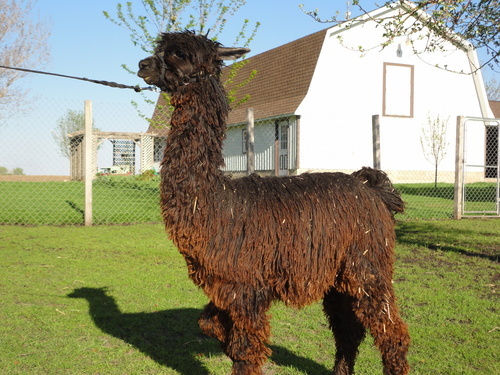 If interested, we are willing to sell Penny with cria at side and a breeding to Red. 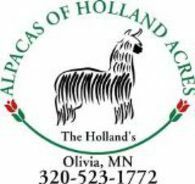 We want everyone interested in owning alpacas be able to do that. We offer financing to fit your budget!